A possible candidate for the ‘Secret Identity’ of the old Town’s saddest spook, The Pink Lady, Mary Witherspon is the only known victim, in November 1823, of the Resurrection Men – Body-Snatchers, who sold corpses to doctors for study and dissection. The grave-robbers were arrested and townsfolk rioted in the streets, but the Widow Witherspoon’s remains were never found. The grave-robbers were a Mr Mitchell, an unemployed schoolteacher, and James McNab - the very Sexton who had buried the old lady. Their employer, a medical student named Robert Forrest, disposed of the body by some unknown means and fled the country...and with no evidence to prove their guilt, the Council were forced to release Mitchell and McNab. Forrest, being a gentleman, was finally - after 33 years as an Army Surgeon - allowed to return home. Was he punished for his crime? No. No doctor was EVER prosecuted for their encouraging the trade in corpses. Instead, he was made Inspector General of Hospitals for Scotland. 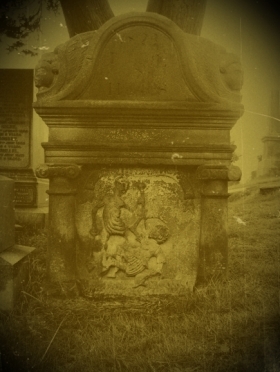 Witherspoon's phantom - still searching for her long-lost cadaver - seems to be an infrequent visitor to the Auld Kirkyard, these days. The last reported sighting - or 'smelling', as the scent of rose-blossom is said to herald her manifestations - was in the 1970s.